I love this poem. It embodies the classic romantic ideal of how living in the country, in harmony with nature, is infinitely preferable to living in the dregs of a city. For me, I am fortunate that I live in a small city nestled in the mountains. I can travel ten minutes from my house and I am walking along gorgeous mountain trails, past streams and waterfalls. I also have the culture of the city, where I can go and attend a concert or visit an art gallery. I have the best of both worlds. 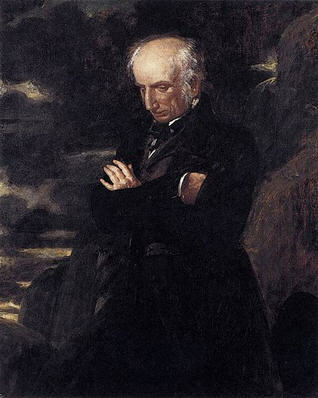 But during Wordsworth’s time, most people were not that fortunate. If I had to choose, I would choose to live in the country. In this poem, Susan has left her home in the country and moved to the city. She appears miserable and is likely homeless. Amid the squalor of the city, she sees a bird and hears its morning song. The sound of the bird chirping stirs her memory and evokes images of her pastoral life. She recalls Nature’s beauty which surrounded her, and most importantly, she experiences the same feelings of happiness and contentment which she felt back then. It is almost like she is temporarily transported to another place which now only exists in her psyche. Unfortunately, the bliss is momentary. Soon reality assaults her and strips the beauty from her inner vision, and she is left standing alone on a desolate street corner. This shift back to stark reality is reflected in her eyes, which are the proverbial window to the soul. No more do they shine with the colors of Nature; instead, they are filled with the dull gray that is the city. As I finish writing this, I am listening to the sound of birds drifting in through my open window. I see the lush green outside that surrounds my home. I think back to when I lived in a big city and how unhappy I was. I am very grateful that I live in close proximity to Nature and its beauty. My soul is that of a romantic. While I love visiting big cities, I could never be happy living there and not getting my regular fix of Nature’s beauty. Very nice poem. I just started reading poetry more seriously and researching interpretations, making sure I am not missing anything. I live in a very peaceful suburb – Sacramento, Ca and know exactly what you mean about the birds singing in the morning, and greenery to observe and appreciate. It keeps the blood pressure low. My mother taught us this poem when we were little. Sadly she died aged 50 in 1982. The first verse is on her headstone. Beautiful poem. Thanks for sharing that. It’s wonderful that your mom shared a love of poetry with you. I hope the poem stirs happy memories.